Note: This biography was written in February of 2003 by Larry Haverstock, who is now preaching for the Kirkland church of Christ where he was Lowell's student from Sept. 1975 thru March, 1980 and again from Sept. 1986 thru June of 1993. Larry readily admits to a profound love and respect for Lowell Williams, his "father in the faith." Lowell Williams was born in the state of Illinois in 1931. He attended grade and high schools in Casey, Illinois, and then entered the Air Force during the Korean war in 1950. During the war Lowell served as instructor at a helicopter mechanic school and was stationed mostly in Texas where he met his wife Doris in 1951. She introduced Lowell to Christ so that in 1952 he became a Christian and also married Doris. In 1954 Lowell left the Air Force and entered Abilene Christian College where he majored in Bible, minored in Greek, and doubled up on his classes so as to receive his four year Bachelor of Arts degree in only two years of intensive study. During 1956 he preached in Las Vegas, Nevada, but after one year returned to A.C.C. and completed his Masters degree in Bible. Lowell then preached in Beaverton, OR, for two years before moving to Kirkland, Washington on July1, 1960. The Kirkland church of Christ is located due east from Seattle just across Lake Washington. This area become Lowell's home for the next 35 years. During the period from 1960 through 1995 Lowell taught as many as 21 classes and sermons per WEEK. Young men from all over the country came to Kirkland for Lowell's schooling in the art of preaching. These classes covered every Bible book, Hermeneutics, Church History, Counseling, Church Problems, Greek, and numerous other studies. During six of these years he hosted "Ask Your Preacher" on the radio, which resulted in over 150 baptisms. The Kirkland church grew to 275 members and moved through three buildings while Lowell was also helped establish five other congregations. Lowell became an elder in 1972 and has served in that capacity to this day. Doris Williams, his beloved wife of thirty-two years, and a fine teacher in her own right, left this earth for her great and richly deserved reward in November of 1984. Eleven years later, 1995 would be a very busy and satisfying year for Lowell as he led the saints in the establishment of the Monroe Valley church (about 30 minutes east of Kirkland) and also married Helen Vandegriff, another fine Christian woman whose own biography is available at the following link: HELEN WILLIAMS BIOGRAPHY. At this time, in his mid 70's, Lowell is still teaching and preaching in Monroe. 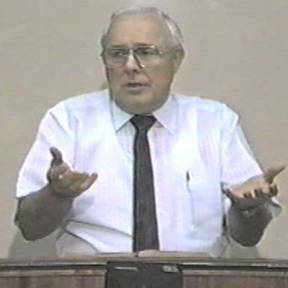 Very few men have taught more classes, brought more people to Christ, done more counseling, or been more generally influential in the proclamation of the gospel than Lowell Williams. Immediately after his arrival in Kirkland, Lowell was asked by V.R. Daugherty to debate John Gibbs of the Green Lake church in Seattle on the topics of church co-operation and the "Herald of Truth" radio program. Lowell was quite reluctant, but V.R. insistent, so the debate was held on Sept. 13-16, 1960. The Northwest church hosted the first two nights and the Southwest church the last two. This debate was recorded and is available through this website. Click here for further information: DEBATES. Again on four consecutive nights eight years later, Sept. 9-12, 1968, Lowell met Robert Slasor who was the "District Missionary of the Reorganized Church of Jesus Christ of Latter Day Saints" in debate. This debate was so pivotal that two things which happened afterward are worthy of note. First, Mr. Slasor personally appealed to Lowell NOT to print the debate in book form. He said that he leaned so heavily on his expectation that the Holy Spirit would prepare him for victory that he did not adequately prepare himself and thus did quite poorly. Secondly, a member of the Mormon church informed Lowell that after the debate a pronouncement was issued to the Mormons forbidding them to EVER debate a member of the Church of Christ again. In these last 35 years, many Christians in western Washington have asked Mormons to debate, but so far they steadfastly refuse. Click here for more information: DEBATES.